The turkey family is quite large, but there are some members who are given a different name and this can lead to confusion. It’s the case of Brush Turkey. Have you ever heard of him? Where does this species spread? 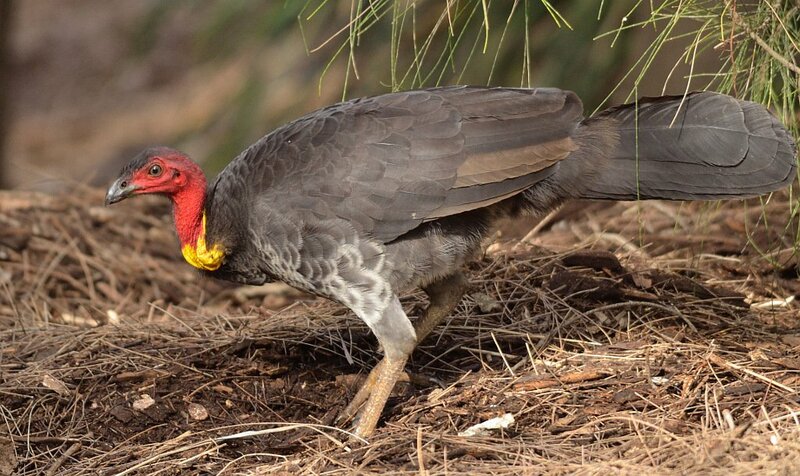 It is also known as red head or Australian brushturkey. Its scientific name is alectura lathami, being a species of the family megapodiidae and the only one of the genus alectura. This species extends throughout Australia, from the northwest to the far southeast of Australia. It is a rather strange bird, which specialists believe could be a primitive species. It is a fairly large bird, measuring between 60-70 cm. The male weighs an average of 2450 grams, while the female usually weighs about 2210 grams because she is small. He has a part of his body with a brightly colored bare skin, while most of his body is covered by a black plumage with whitish undertones. The male has a large, bright yellow beard, while the female has a smaller, paler beard. The color of the head and neck feathers may be brighter during the courtship season. They are usually much more muted during the breeding season, when the beards are reduced. Your iris is pale brown, yellow, or cream-colored. Another sign of sexual dimorphism is that females have a pouch on their neck, almost imperceptible to the naked eye. Alectura lathami purpureicollis: Found in northeastern Australia. Alectura lathami lathami: The nominal subspecies that lives in eastern Australia. How is their life in nature? It is a rather lonely species, and aggressive to each other even though they may form small groups. In addition, they often intimidate smaller birds when they approach their territory. It is not a monogamous species, and a male can mate with many females during the same breeding season. During the breeding season they dig a hole in the ground, digging, and leaving leaf material with their legs to decompose. It’s the male that’s building the nest. The mound can be one meter high and more than four meters in diameter, which is maintained by the male for at least nine months in each nesting season. After mating with the female, the male allows her to lay her eggs in the nest she has made. When they have finished depositing them, they violently move away from the nest and cover the eggs with humus. Sometimes the eggs are also fertilized by another male. Unlike other types of birds, they do not incubate their eggs, but let the heat of the sun do the work. Each mound may hold up to 33 eggs. The chicks hatch almost a month or two after laying. The male will take over most of the time, although the female can also participate in this work. Their diet consists mainly of insects, seeds and fallen fruits.